District Heating « Global Market Insights, Inc. 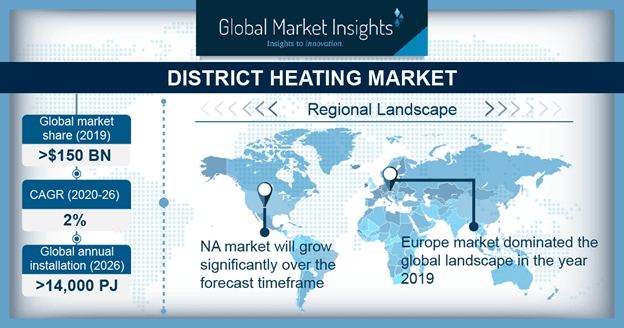 The global district heating and cooling (DHC) market is poised to witness an accelerated growth in the consequent years, primarily owing to growing environmental concerns. Driven by the urgent need to curb carbon emissions, global and regional governments have enforced suitable regulatory measures that have further upheld this industry. As per estimates, the global DHC market was valued at approximately over $200 billion in 2017 and is anticipated to double its remuneration by 2024, given that emerging economies are increasingly investing in the development of various commercial and residential establishments that have a centralized heating and cooling system. An outcome of economies of scale, the centralized system of DHC is often extremely cost-efficient when compared to the conventional de-centralized systems. However, an obstacle in the growth of this vertical would be the initial investment required for planning and establishing a distribution infrastructure for the installation of a DHC system. The system’s cost-effectiveness also depends on whether there exists a pre-established distribution infrastructure which could be employed to deliver the DHC services. In case of an existing network, centralized generation costs 40% less than a de-centralized capacity. 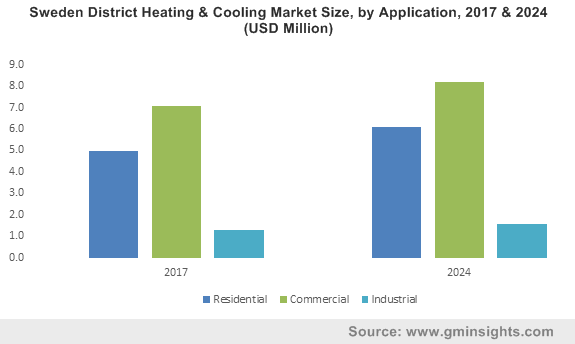 District heating & cooling market size from combined heat and power (CHP) market is slated to grow by approximately 6% over 2018-2024. According to the International District Energy Association, traditional power plants are extremely inefficient when it comes to generating power as they only extract and convert only about 35%-40% of the energy from the fuel to generate electricity and the remaining 60%-65% of energy is turned into heat which is then released into a local waterbody or into the atmosphere through a smokestack. The association deems this extreme inefficiency to be a massive problem. However, this obstacle also provides a massive opportunity for CHP plants to effectively harvest the immense heat byproduct to produce steam, to heat or to chill water and then effectively cool or heat the surrounding residential or commercial complexes through a DHC network. According to the association, CHP plants witness fuel efficiencies of around 75%-80% on a regular basis. Additionally, they significantly boost operating efficiencies while decreasing the carbon footprints, thereby providing a massive scope for the expansion of DHC industry from the CHP energy source. The rapid shift from traditional power generation plants to CHP plants is thus slated to augment CHP-based DHC market. While CHP has garnered commendable traction, DHC industry players have also been tapping the solar energy source rather prominently. As more and more developed and developing economies turn to renewable sources of energy to fulfil their annual energy needs, it is anticipated that the global DHC market will also experience substantial momentum with the adoption of solar power as an energy source. According to a report by the International Energy Agency the only factor that would limit the development of SHC is the scarcity of viable rooftops and ground space that would house the solar collectors at a location that is accessible to the DHC network. However, even with this constraint, it is being speculated that most of the nations across the globe will come to adopt solar power as an energy source to fuel DHC systems across residential, commercial, and industrial establishments. According to a 2017 report on SHC by the International Solar Energy Society, over 30 GWth of new solar thermal capacity was authorized in 2017 alone, boosting the global capacity to over 470 GWth. Global Market Insights, Inc., claims that the overall DHC market share from solar power was pegged at $4 billion in 2017, primarily driven by the low operating costs, environmental viability, and ease of installation. Solar power is likely to be majorly adopted across developed as well as developing nations, especially across Europe. Indeed, the European Commission has targeted a deployment of SDH systems across Denmark, Italy, Czech Republic, and Germany, with plans to extend a capacity of 8 GWth by 2020. Although the global DHC market entertains the deployment of fossil fuels like gas and coal to power the centralized DHC hub, there is a significant untapped potential to upgrade the systems to enable them to employ renewable energy sources like solar, solid bio-fuels, different geothermal technologies, low ambient temperatures and waterbodies. The availability of these cost-competitive clean energy sources makes DHC becomes an extremely worthwhile, cost-effective, and viable service, the rising adoption of which would impel DHC market trends. According to Global Market Insights, Inc., the overall DHC market is expected to exceed an annual energy consumption of 19,000 PJ by 2024. This entry was posted in Sustainable & Smart Technologies and tagged Absorption Cooling, CHP, District Cooling, District Heating, District Heating and Cooling Market, District Heating and Cooling Market Size, Electric Chillers, Energy Source, Free Cooling, Geothermal, Global District Heating & Cooling Market, Heat only Boilers, Heat Pumps, Solar.